Home » Uncategorized » Exciting Green Building Internship with Southern Exposure Seed Exchange! Exciting Green Building Internship with Southern Exposure Seed Exchange! Our friends at Southern Exposure Seed Exchange are looking for an intern to help them out with an exciting green building opportunity! This is a season-long internship at their establishment in Mineral, VA. Read on for details! If you’re interested in building with natural and local materials, and if you’re like to learn about efficient and sustainable systems and design, you’re welcome to join us. Experienced builders are certainly welcome, however we want this to be an educational opportunity and will work with whatever ability you’re at. As we’re a feminist community, we want to specifically encourage non-male identified folks to join us, seeing as a disproportionate percentage of males are represented in the mainstream building sector. Construction has already begun will probably last through fall. 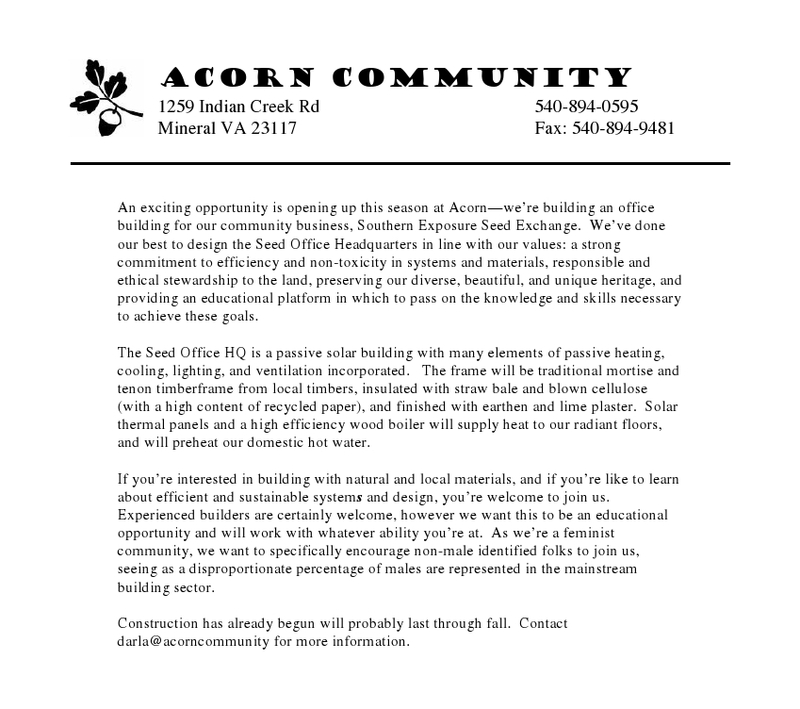 Contact darla@acorncommunity for more information.